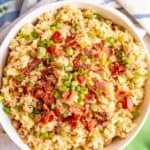 Black eyed peas burgers with brown rice and bacon are like the traditional Southern hoppin’ John dish in burger form – perfect for New Year’s or any delicious dinner! My husband and I do have a cute little tradition though for New Years Eve. 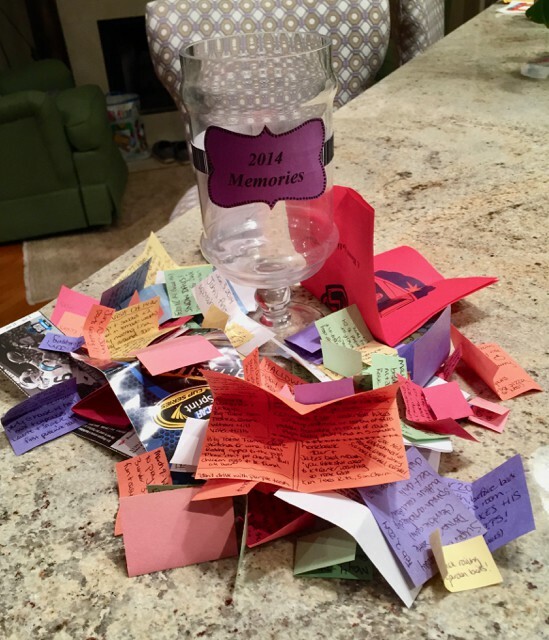 All year long, I put notes of fun memories, crazy things the kids do or say, stories from trips or family visits and any sport/play/concert ticket stubs into a jar. On New Years Eve, we dump the whole thing out on the counter and take turns reading back over all the notes from our year. Some notes make us chuckle, some make us shake our heads, some prompt us to look up photos or videos, but they all help us remember all the little moments along the way. Anyway – onto the FOOD! I’ve been all about the Southern goodies this month. We had my overnight cheesy grits casserole, my Southern collard greens with bacon and my Southern New Year’s Day dinner skillet. 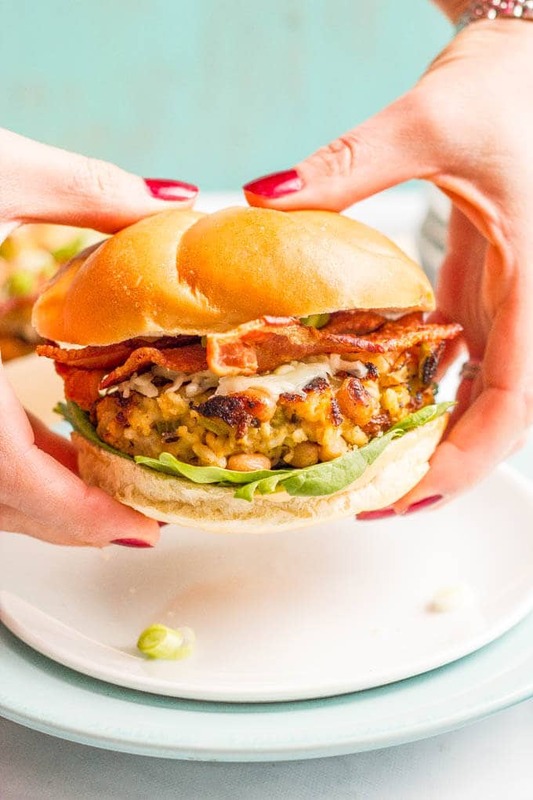 And today’s black eyed peas burgers (aka hopping John’s burgers) are right in that same wheelhouse of being perfectly New Year’s appropriate, all kinds of Southern flavored and a touch healthier. Basically we’ve got all the traditional hoping John’s ingredients but remade into a hearty bean burger. And these have seriously great flavor! 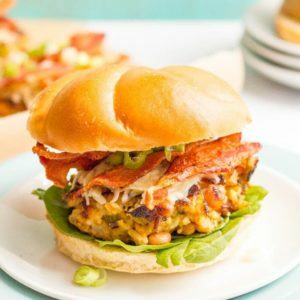 The smoky bacon flavor is infused throughout the burgers and the black-eyed peas are mashed slightly to help bind the burgers. They get topped with the reserved bacon, cheddar cheese and sliced green onions for a loaded up burger that will stick to your ribs! I prefer thick-cut bacon, but any kind will do. You only need the grease from about 4 pieces of bacon to cook the veggies, but if you want two full pieces to top each burger, make 8 pieces of bacon. I always have plenty of bacon grease (you need at least 1 tablespoon but a little more is OK). If you don’t have enough, add some extra-virgin olive oil until you have the right amount. You could make these vegetarian by skipping the bacon and using all olive oil for the recipe. 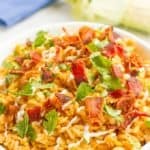 It would take away from the flavor a bit, and not be traditional, but should still be delicious! Be sure to flip the burgers carefully, too. I use a spatula in one hand and use my other free hand to help guide them. You can also use your spatula to nudge the burger back into shape after they’ve flipped if yours falls apart a little. Wishing you all a safe and fun weekend and a prosperous, happy New Year! 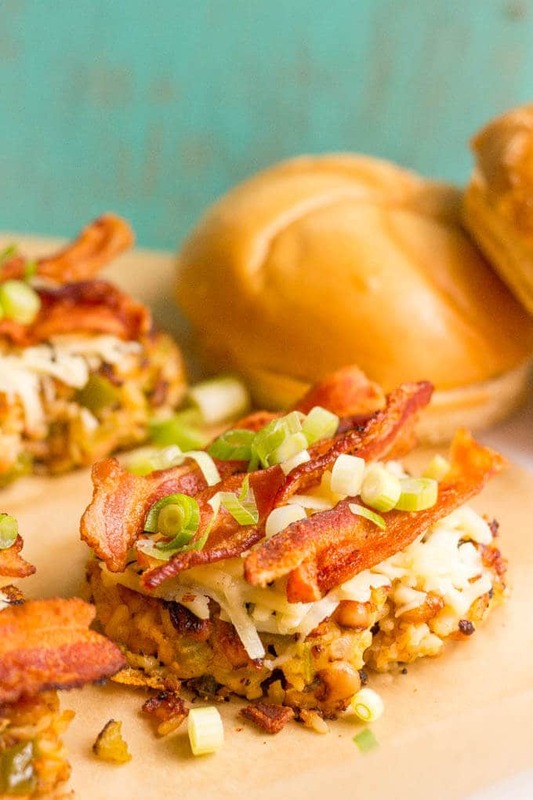 Black eyed peas burgers with brown rice and bacon are like the traditional Southern hoppin’ John dish in burger form! favorite burger toppings: lettuce, tomato, mayonnaise, etc. Heat a large skillet over medium heat and add bacon. Cook until crisp on both sides, turning as needed, about 8-10 minutes total. 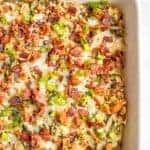 Remove bacon to a paper towel, crumble and set aside. Drain (and save) all but 2 tablespoons of bacon grease from the pan. Add chopped onion, green pepper and celery to pan and sauté in the bacon grease for 5-7 minutes, until tender. Add garlic and sauté another 30 seconds. Meanwhile, in a large bowl, use a fork to roughly mash the black-eyed peas. Add the cooked rice, salt, pepper and hot sauce. 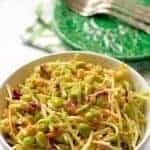 Once the veggie mixture is cooked and slightly cooled, add it to the bowl and stir to combine. Taste and adjust seasoning. Add the egg and stir to combine. Heat the pan (I use the same one) over medium-high heat and add 2 teaspoons of reserved bacon grease (or use extra-virgin olive oil). 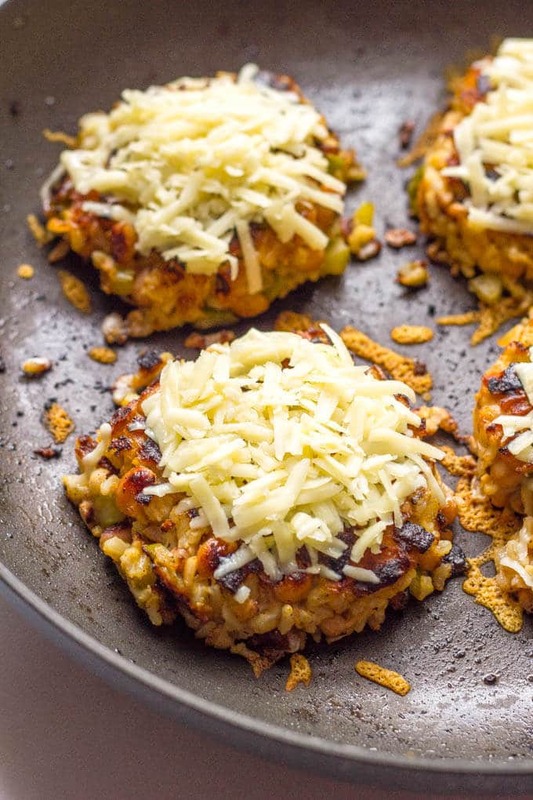 Cook burgers over medium-high heat for 5 minutes, then carefully flip over, top with shredded cheddar cheese and cook an additional 4-5 minutes, until done. 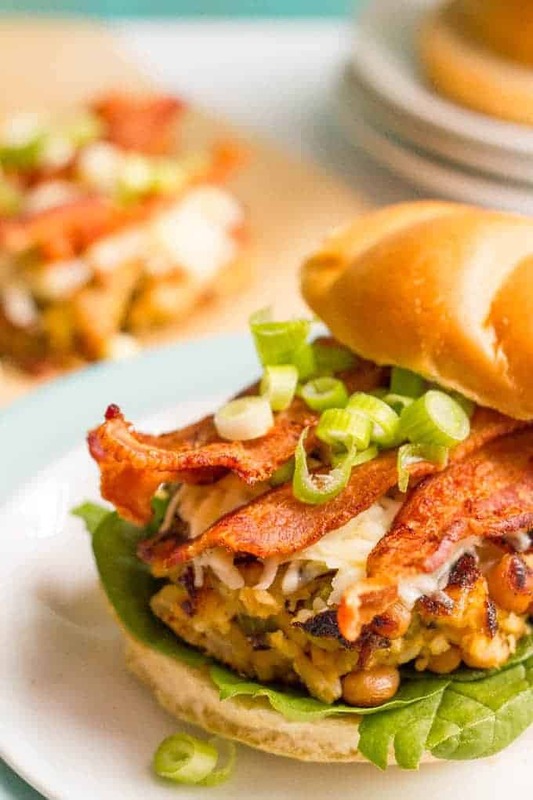 Serve on buns topped with green onions and reserved crumbled bacon and any other favorite burger toppings. I always have plenty of bacon grease (you need about 2 tablespoons but a little more is OK). If you don’t have enough, add some olive oil until you have the right amount. I make black eyed peas every New Year’s day for good luck and love your new way of preparing them. I’m glad I discovered your blog, thanks for the inspiration. Wishing you all the best in the New Year. They’re a staple on New Year’s Day here, too! So glad you found me Karen and wishing you a wonderful 2017! 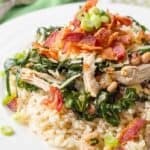 What a fun way to incorporate many new year’s food traditions! 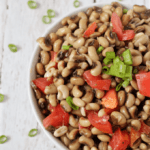 I’ve actually never tried black eyed peas, but your pictures look so yummy I may just have to go out an get a can. You gotta do it Kelli! They’re a Southern staple and so nutritious! I think you’d love them! Happy New Year!